Hey y'all! I hope the last week of July is going well for you and that you aren't melting in the heat. I walked my dogs for about ten minutes yesterday and I immediately started pouring sweat. It's so gross outside. I skipped my weigh in last week because I went to bed too late the night before and frankly, I wasn't too excited about getting on the scale. I will get on in a couple of days to see where I am. Right now, my motivation fluctuates by the minute. At the risk of being a broken record (I realize I've been one for years now), I'll just attempt to take it one day at a time. 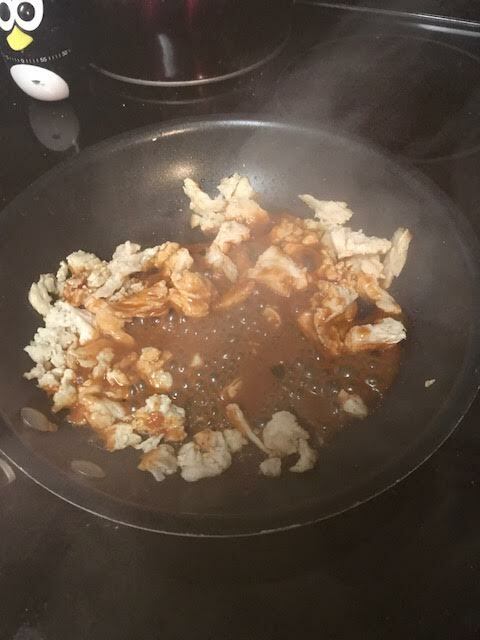 This week I wanted to share two recipes that I threw together with shrimp only using groceries I had on hand. I had an idea last week to make a quick shrimp and grits. This dish is typically a rich, luscious bowl of goodness loaded down with fat. I won't pretend mine lived up to a restaurant style shrimp and grits but it WAS delicious. I sautéed zucchini, onion and shrimp in a skillet using a couple tablespoons of an olive oil based dressing. That way, it already had built in oil and flavor so I didn't have to use butter or additional oil. While that was in the pan, I took two packets of instant grits (one ham flavor, one cheddar flavor) and cooked them in a sauce pan after boiling about half a cup of water. Once it was done cooking, I added a bit of unsweetened almond milk to make the grits a bit creamier (not to brag but this was a great idea on my part...it really worked!). When it came time to assemble, I put the grits in the bowl, added the zucchini, onion, shrimp mixture and then topped the dish with a few real bacon bits and some fresh, shaved parmesan. 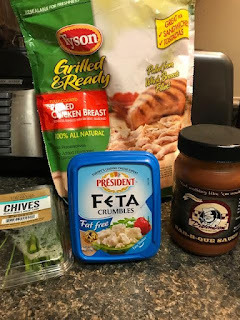 This was a ton of yummy food with lots of flavor (FYI, I also seasoned the shrimp with salt, pepper, garlic and smoked paprika) and VERY little fat. Not only that, it took me about ten minutes to make. I will most definitely be making this again. I forgot how convenient, filling and guilt free a packet of instant grits could be. The next day, I used the remaining shrimp by slinging them on a couple kabobs and throwing them on the grill. I seasoned those with salt, pepper, garlic powder and smoked paprika and cooked them on the grill a couple minutes on each side. 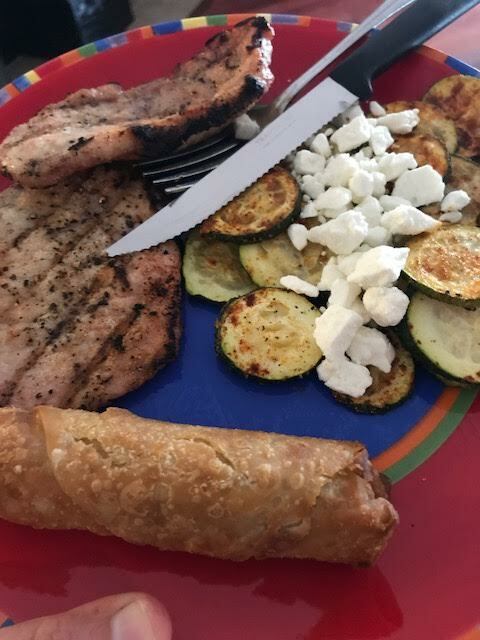 While they were grilling, I threw together a Greek-style salad with fat free feta, kalamata olives, the same olive-oil dressing, onions and cucumbers. I topped the salad with the shrimp, shaved parmesan and a few Goldfish crackers for croutons because I'm a giant 5 year old. It was big and bright and a perfect summer lunch. Shrimp is awesome because it takes almost no time to prepare and allows you to have a break from chicken and vegetables when you're trying to eat healthy. Hey y'all! We are right in the middle of the week and I hope it's going well for you. I was up over 2 pounds when I weighed on Saturday which was both surprising and typical. I think I was getting paid back for the week before as my behavior last week didn't warrant that much of a gain. 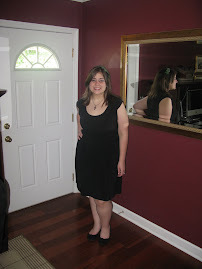 I'm feeling frustrated with my body. My lack of metabolism combined with the summertime slump I face every year as a teacher is zapping my motivation. I've done well this week but feel bloated and down after two disappointing weeks in a row. I'm doing everything I can to keep it going because I know once school starts, things should get better. My teaching routine bleeds into my food routine and getting up to work at the same time every day gives me more energy. Don't look for much positivity from me this week. I'm not feeling it. One of the reasons I have issues is I have an undying love for junk food. I love chips and dip and fast food. I don't really eat it anymore, or at least not regularly, but I still crave it. One of my favorite dips on the planet is Buffalo Chicken Dip. I never make it but if other people do, I'll eat it until I'm sick. Well, it came to my attention that grocery stores have started selling it with the other dips. I thought this would be perfect because I would know exactly how many calories I was having and I could break out the measuring spoons so I didn't eat too much. So, I was at Wal-Mart and despite the horribly obnoxious and dumb branding, I bought their Buffalo Chicken Dip. I feel dumb for buying any food branded only towards men but to be honest, I also drink Dr. Pepper 10. Even though I contributed to the random sexism found in a dip, I will admit I enjoyed eating it. 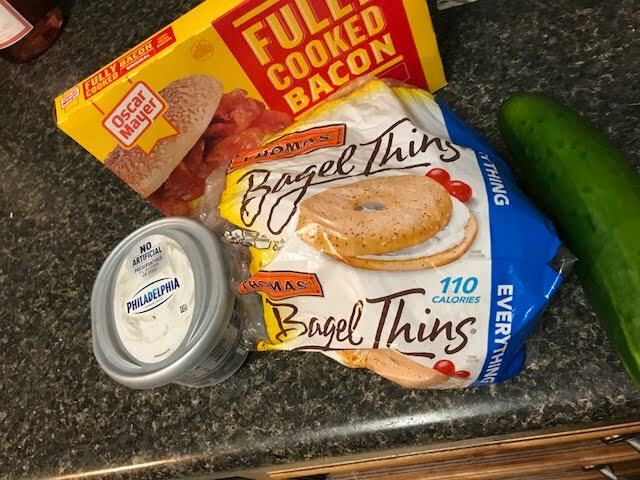 It wasn't as good as the fresh, hot dip I've had at parties, but it had great flavor and went well with the precisely 53 pretzels I ate it with. I'll probably seek out a different brand next time but I'm happy to know it's a snack I can buy anytime. Not only do I love junk food, I also enjoy fast food. 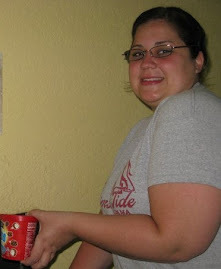 What I find more frustrating than anything about my fluctuating weight is that I don't eat the "no no" foods anymore. I can't remember the last time I just popped through a drive thru for a burger and fries, or had a pack of Oreos in the house. I don't eat chicken fingers or pasta dishes or desserts at restaurants. I've completely changed the way I eat and yet, I gain weight. All it takes is an extra beer on the weekends, or too much food on a Sunday night or one fun day at a food truck festival for me to gain weight. Anyway, I digress. I was craving foods that a toddler would ask for so I decided to make chicken nuggets and fries. I used the single serve fries that I've been using which are so easy to pop in the microwave. 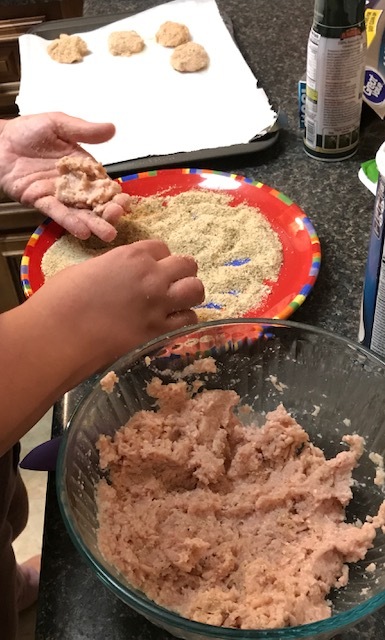 The nuggets were actually made with ground chicken. I combined the ground chicken (which was seasoned with salt, pepper, garlic and parmesan cheese) and then formed them into a nugget shape. After that, I dunked each nugget in a combination of Italian seasoned bread crumbs, more garlic and more parmesan cheese. Excuse my aggressive man hands in the photo but I wanted you to see the process. Once they are all lined up on a pan, pop them in the oven at 350 around 15-20 minutes, until they are golden brown. While they baked, I made my fries (and also threw an egg roll in the oven to complete my brown food trifecta) and made a dipping sauce. I used light mayo, sriracha, garlic and ketchup. There's no exact plan for this. If you like it more spicy, add more hot sauce or if you want creamier, add more mayo. You get the idea. The nuggets had good flavor but I do wish that I had baked them a bit longer. Also, I like ground chicken, but for nuggets, I think I'll use chicken breasts next time in the food processor. The ground chicken flavor made it taste like chicken nugget burgers and it was a little weird. 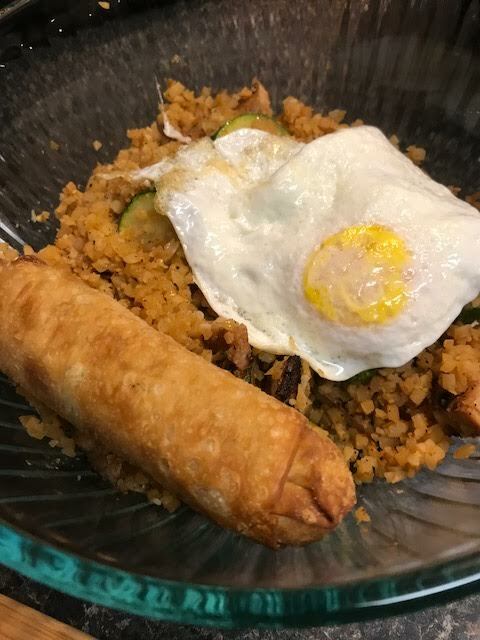 I mean, I ate it, but it was weird. Hey y'all! We are half way through July and I am a little over a month away from the fall semester. I've been working on lesson plans and syllabi and to be honest, I'm ready to start back. I thrive from deadlines and structure and the summer is just a rogue, purge-like place where there are no rules. It makes it difficult to get anything done. 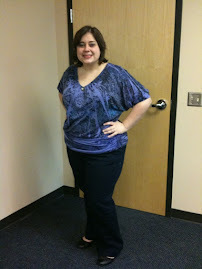 In terms of weight, I gained 1.4 pounds after the awesome 3 pound week I had before. I fully expected this gain after the weekend of the fourth and my Dad's birthday. Actually, I'm glad it wasn't more. This week, I'm kind of meh about counting points. I am over it. That's never a good thing. Having said that, I've been reluctantly on top of my game. That means my weaknesses could shine through at any moment. I'm working on finding a renewed motivation to give me some umph until school starts. The best way for me to stay within the parameters of my point allowance, is to find quick and easy grocery store items that I can rely on. 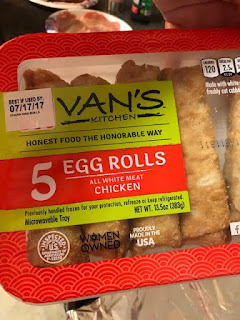 I actually heard about Van's egg rolls in a Weight Watchers meeting and I'm so glad I found them. They are only 120 calories (3 points) and taste delicious after being baked in the oven. I eat them with anything but they were especially nice as a side to pork chops and then with my cauliflower "fried" rice. By the way, I impressed even myself with the cauliflower rice I made this week...putting the egg on top made me feel fancy. 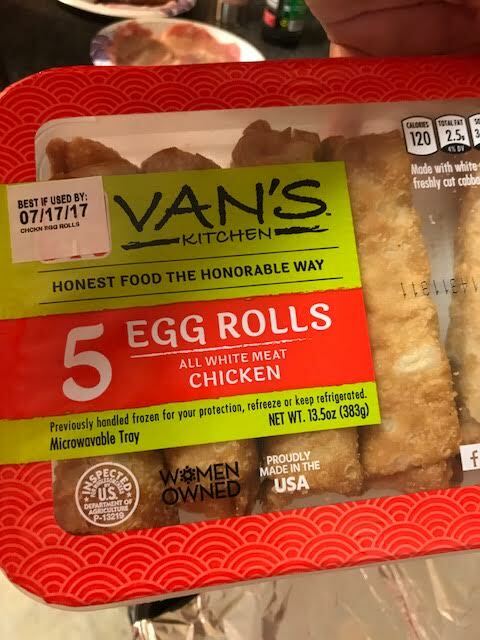 I give these egg rolls a thumbs up for sure. So, I love barbecue sauce, but because of the sugar, Weight Watchers makes it difficult to eat it. What I have discovered is that I can have 3 tablespoons of Dreamland BBQ sauce for 1 point. It is a bit less than others because it's not as sweet. In fact, it has kind of a kick to it. I love Dreamland sauce so I've been using it a lot, even as a salad dressing. My most successful Dreamland fix was a quick lunch where I made a barbecue chicken sandwich. 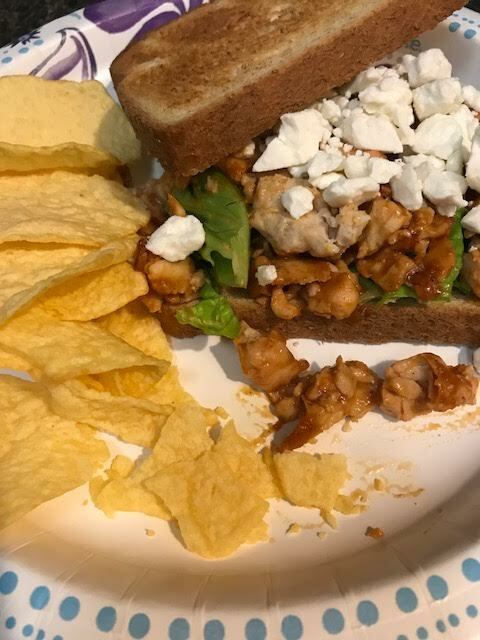 All I did was heat up a couple ounces of Tyson's frozen pulled chicken, added the sauce, lettuce and fat free feta. It was a fast and delicious sandwich. Dreamland sauce is adding flavor to my life for the time being. Do y'all have any fast, yummy ideas to stay on track during the week? Let me know! Until next week, y'all! Hey y'all! I hope you had an awesome holiday. If you had to work, God Bless You! I'm so sorry! I'll jump right in today. 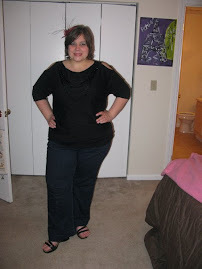 When I weighed on Saturday, I knew that I had rocked the prior week. I exercised like crazy and ate like a champion. 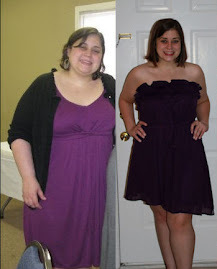 When I stepped on the scale, it was just what I thought...I was down 3.4 pounds! 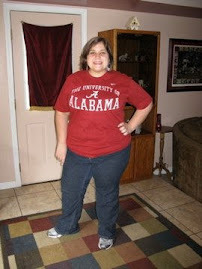 That brought my total to over 5 since I started Weight Watchers again. In part, I worked extra hard the prior week because I knew that the several days after the weigh in were going to be challenging. What I didn't know is that I would turn into the Incredible Hulk and eat every carbohydrate and grilled meat in sight. I ate too much, I drank too much and I felt like such a sloth. Between 4th of July celebrations and my Dad's birthday, it wasn't pretty. I'm back on track today and I'm hoping to do some recovery before weighing again on Saturday. Despite the fact that I will most likely see a gain at my next weigh in, I'm still feeling strong and motivated. Sometimes, you just have to have a few days of indulgences. Speaking of being strong, one of the ways I've stepped up my game is at my gym. 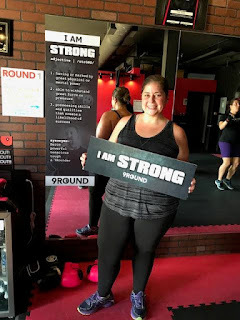 Mostly, I do it kicking and screaming, but the trainers at 9 Round Fitness (specifically one crazy guy named Terry) push me in the best way. I've officially taken the boxing Kool-aid. 9 Round is definitely an investment. It's more heavily priced than a gym that only charges $10 a month. What is does do is gets your heart rate up and allow you to get rid of any pent-up rage. I've done a lot of fitness plans at home but I never find the self-motivationto push myself. I've also been a member of many gyms and there's not another place that allows you to come whenever, stay as long as you want and include one-on-one training with an experienced personal trainer. If you have one in your town, I highly recommend giving it a shot. I believe that chips and dip should have their own food group on the pyramid. I love dipping anything into anything and when I'm dieting, I usually lean on cucumbers to get me through chip cravings. I don't really like carrots so cucumbers are lifesavers, though I'm not pretending they are as good as chips. 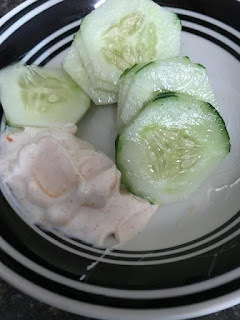 I dip cucumbers in hummus and/or salsa all the time. One of my favorite dishes is cucumber salad. My mom makes this and it's a concoction with mayo, sour cream, garlic, onion, salt and pepper. Since the dish has full fat mayo and sour cream, and it's hard to tell exactly how much you're getting, it's not exactly healthy. 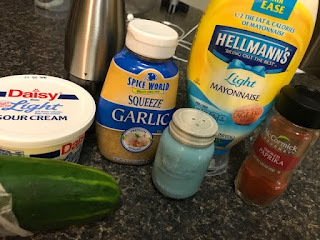 I love the flavors so I made a little dip out of one tablespoon low fat mayo, two tablespoons light sour cream, a squeeze of minced garlic, salt, pepper and smoked paprika. It had a wonderful flavor and creamy texture. 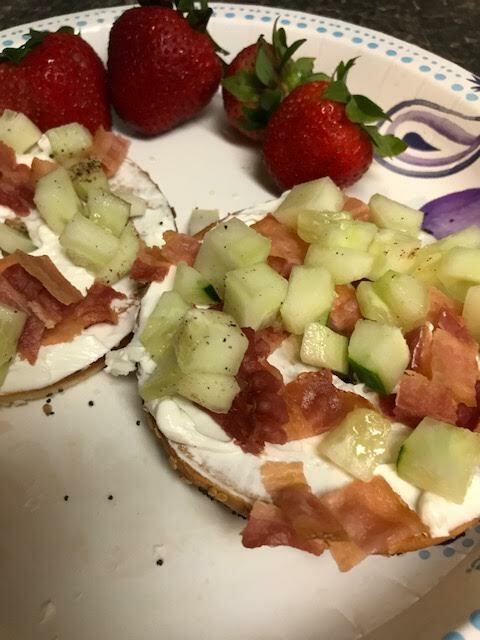 It was perfect for a snack! 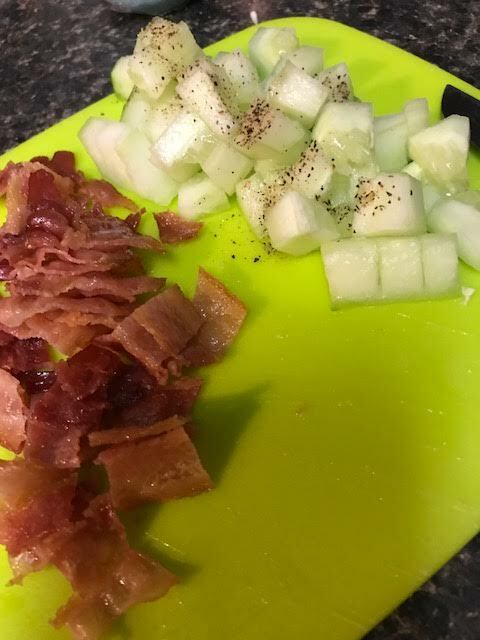 If you don't like cucumbers, I get it, vegetables are the worst. If you do like them, think of the ways you can jazz them up and throw them into every meal and/or snack!